According to the Michigan Sea Grant, the Great Lakes shoreline is equal to almost 44% of the circumference of the earth. Mandamin joined the team of indigenous representatives from the Indigenous Environmental Network at the People’s Climate March during the week of September 18th to the 24th. In Anishinaabekwe culture, women are given the responsibility to take care of the water. “The water of Mother Earth, she carries life to us, and as women we carry life through our bodies. We as women are life-givers, protectors of the water, and that’s why we are very inclined to give mother earth the respect that she needs for the water. 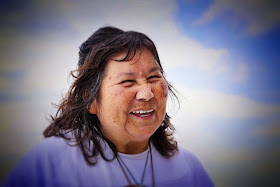 That’s our responsibility, our role, and our duty, to pass on the knowledge and understanding of water, to all people, not just Anishinabe people, but people of all colors,” said Mandamin. In the wake of extreme extractive industries such fracking, oil, and coal, access to clean water is rapidly declining. Thanks you this writing and sharing these messages.